In contrast to the conventional wisdom that mechanics is a relatively mature subject, two features of mechanics revitalize its appearance and internal core. The first feature comes from the deep-mind nature of mechanics, it endlessly pursues the mechanisms for interactions of all kinds. The second feature lies in the inclusiveness and interlinking nature of mechanics. As a bridge between science and engineering, mechanics marches to connect all gaps between fundamentals and applications. It serves as a basic tool of engineering sciences . The present article endeavors to explore the new horizon of mechanics in an extended or crossed form, toward physical sciences, life sciences, and even social sciences. We name this new phase for the development of mechanics X-Mechanics. “X” refers to as “cross” and/or “extended”. The contents of different “crosses” will be enumerated in the consecutive sections: namely cross media, cross scales and cross compliances. These crossing investigations will touch upon the contents, the methodology, the behaviors, and the functions underlying X-Mechanics. Case examples will serve to illustrate that X-mechanics is an endless frontier. Soft matters can be viewed as the cross-media assemblies of solids and fluids, or as composites with solid and fluid phases. We term such medium the generalized soft matters. The medium under consideration may be extended to live medium or social medium. The mechanics for generalized soft matters constitutes the content of cross-media study of X-Mechanics. Attention is focused on three representative cases of the generalized soft matters: hydrogels, brains, and social media. They will serve as the case examples for physical media, life media and social media. Hydrogels are 1-3 solid/fluid composites. Hydrogels consist of a hydrophilic polymer network and a large amount of water as the dispersion medium. Tough hydrogels derive their high toughness through dissipation [4-6]. Although the contents of the filling water molecules may reach as high as 90%, one can realize extraordinary fracture energy as high as 9000Jm-2 for polyacrylamide-alginate hydrogel . The key of high fracture toughness relies on the non-local energy dissipation transmitted via the ductile network . Brains constitute another interesting case of the generalized soft matters. Brains can be regarded as the hydro-neural network filled by mud-like organic medium. Brain greys, brain writes, neurons, memory cells and water are the main filling ingredients of the brain mud. They supply water, energy and data storage to the operation of neural network. The interaction between the mechanics field and the information stored in the brain brings in an intricate aspect of brain functions. The mechanical environments may include the brain pressure contained within the skull, the neural induced psychological tension over the network, the stress wave propagation due to external impact, and the stroke or bleeding by bloods in brain vessels. Connectome equipped with diffusivity tensor analysis (DTA) can be used to obtain vivid images of neural connections in the brain, and to facilitate the surgeries for removing brain tumors. The neural connections bear the importance of knowledge creation and data convergence. The dynamics of Synapse formation and plasticity under psychological stress gives a new dimension for the intimate interaction between mind and bodies [20, 21]. The last case example for mechanics of generalized soft matters is the study on social safety. The interests on the issue of social resilience are gaining momentum [22, 23]. Social resilience is a mechanics concept. The theory discussed the driving force, the deformation, and the adaptation of the society. It, however, lacks two important ingredients for the formulation of a continuum mechanics theory: (1) a proper space over which a social continuum can be defined; and (2) length dependent social defects over which the fracture toughness in the sense of Griffith  can be introduced. A society space (dimensioned over social status, classes and wealth) can be proposed for the discussion of social resilience, while a physical space can be used for the study of city (or region) resilience. A social medium can be described by a sample of generalized soft matters. The constitutive laws for the social medium are envisaged as the macroscopic averaging of social networks filled with viscous fluids, just like hydrogels. Similar to the case of toughened hydrogels [4, 5], the social network can be characterized by two folds, one is the strong network representing the guidance, the organization and the resource allocation by ideology motivated political parties, and the other is the weakly interacted community networks, such as neighborhood community, social surveillance, social communication networks and professional societies. The filling fluid can be modeled by Maxwell fluid representing the cultural, financial and service interaction, and whose viscosity is governed by social chemistry. The segregation of the society may induce in-homogeneities or defects within the medium. The social medium should be amendable and restorable, by the damage control measures in the social networks, resource (such as aids) allocations, and new social policies. The capacities for plasticity and revitalization measure the resilience of the social medium, and depend largely on the leadership of the government and the incumbent party. The loadings on the social medium are composed of two parts: chronic stresses and acute shocks. The former is caused by the sustained imbalances such as disparity, competition, insufficient accommodation, and social injustice. The latter is encountered after nature disaster, famine, war, and infectious deceases; they may cause impacts and wave propagation to the society. Similar to the formulation of fracture mechanics, the issue of social safety or social resilience can be viewed as the initiation, the propagation, the energy dissipation, and the repair of social defects or gaps. The fracture of a society occurs when the driving force for fracture exceeds the social resilience to defects of critical scale. The social resilience depends predominately by the energy dissipation against social fracture. If the social network is weak and the social viscosity (governed by social chemistry) is low, a cleavage-like fracture occurs. Just like the breaking of a conventional hydrogel, a fracture process zone to release the fracture energy is absent. The society is “cold” and fragile, and the social resilience for this case is solely dictated by the defect size. If the social network is weak but the social viscosity is strong, one encounters ductile fracture, with a developed process zone with a high chemical potential, resembling the smash of a hydrogel with single-layered networks. The social resilience for this case relates to not only the defect size, but also the social chemistry. If both the social network and the social viscosity are strong, the social network would channel all the energy in the social medium toward the propagating crack tip, and achieve extraordinary high fracture toughness. The same mechanism is reported by the case of hydrogel with double-layered polymer networks [4, 5]. Furthermore, the rapid repair by the strong organization network would promote the healing of a society crack, so that it may never achieve the critical size for catastrophic failure. The same idea can be carried to the issue of resilient cities [25, 26]. Most mechanics analysis shares a cross scale nature, as exemplified in Fig. 1a. The emergence of deep learning  paves a new avenue for the cross-scale studies of mechanics (Fig. 1b). The inter-disciplinary research among mechanics, physics, mathematics, and information technology may bring new insights into the intricate cross-scale problems. One could examine this development from three aspects: theoretical, experimental, and computational. Figure 1 (a) A multiscale view of a polycrystalline aggregate from electron distribution to continuum. (b) A unified data-driven approach may tackle the cross-scale problem of deformation and fracture. The insets are typical structures at different scales. From a theoretical viewpoint, a cross-scale deep-learning reflects the hierarchical heritages of different aggregations of matters. Two approaches co-exist: one calls for analytical correlation, another calls for data correlation. The formulation of fluid mechanics is intrinsically coupled by energy cascade through different scales in the fully developed turbulence. The universal scaling law (started with “K41” representing an energy power slope of -5/3) is observed for energy transfer through different scales and different frequency spectrums, as validated by She and Leveque . Through turbulence, energy can be transmitted from swirls of a large scale to the ones in smaller scales or vice versa. The formulation of solid mechanics, on the other hand, can be approached via different physical scales spanning from quantum mechanics, molecular dynamics, me-so-mechanics to continuum mechanics formulations . The different formulations of solids enable the possibilities of hierarchical linkages, either via cross-scale analytics such as homogenization, heterogenization, global-local approach, and multi-physics description, or via deep data analytics, such as hierarchical deep-learning, neural network, and adaptive learning (Fig. 1b). The trans-scale interaction has been addressed by many formulations. For examples, the effect of continuum fields on the quantum physics can be incorporated by engaging a strain potential into Schrodinger equation . The effect of electric cloud on atomic particles may be addressed by the Embedded Atom Method . The interaction between continuum and particle formulations of solids can be addressed by Quasi-Continuum Method , and so on. Unlike the well-established scaling law for cross-scale interaction of fluids, the studies on the failure of solids lack the counterparts of energy cascade from different scales and different spectrums. In the traditional approach of fracture mechanics, the released global energy flows into local defects. The issue of interaction be-tween global energy and local energy has yet to be ad-dressed. The concepts of turbulence and vortices may be extended to the study on the hierarchical fragmentation of solids. From an experimental viewpoint, cross-scale and multiphysics experiments are a fascinating endeavor. Most existing tests are carried out in a sequential style. The cur-rent challenge should be the in situ and in vivo cross-scale experimental observations. Take the case of multi-scale measurements on the deformation and the failures of a solid. The tests should be performed at the same location and the same instant, but with output data pertinent for different physical entities or different resolutions. New experiment facilities are designed to observe the same focus point by means of multiple optic beam lines , or synchronized by matching time series. 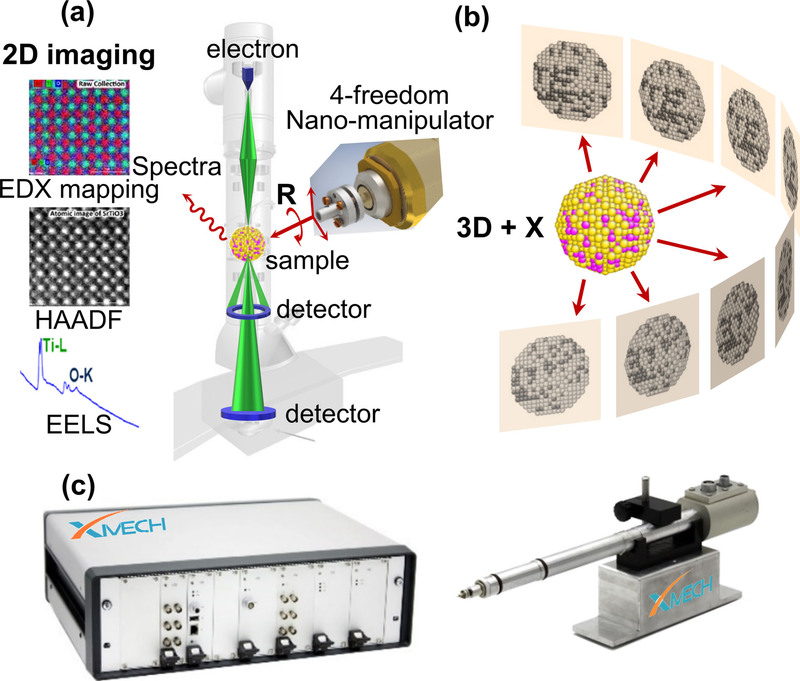 Recent development in transmission electron microscopy provides a valuable plat-form for cross-scale experimental mechanics, linking material information flow from sub-angstroms to microns. Equipped with multiple detectors, the elemental and structural information can be simultaneously obtained, atom column by atom column, in two-dimensional projection space (Fig. 2a). When superposed with atomic specie in-formation, three-dimensional spatial arrangement will pro-vide unprecedented understanding of materials (Fig. 2b). The strain tensor can be derived directly from the relative atomic position with pico-meter accuracy. Nano-mechanics equipment is developed at the Center for X-Mechanics of Zhejiang University that is capable of 4-axes manipulation of the testing samples within the vacuum chamber of HRTEM, as shown in Fig. 2c. Beside mechanical loadings, the facility allows electric loading and self-generate heating. Figure 2(a) The state-of-the-art aberration-corrected transmission electron microscopy simultaneously captures both the atomic arrangement and elemental information in 2D space. (b) A series of 2D images obtained by rotating the sample around a tilt axis lead to 3D reconstruction with the coordinates of individual atoms. (c) A dedicated four-degrees of freedom nano-manipulator is invented to facilitate this process. In fields of computation mechanics, affordable methods are wisely adopted at different scales for limited computing resources. A smooth transition across domains modelled by different methods requires accurate interpretation of state variables, which is notoriously known as an artistic and demanding handcraft. However, the methodology of computational mechanics and artificial intelligence shares the same data-driven principle and the same hierarchical and multi-layers approach (Fig. 1b). It is inspiring to compare to the vision system, a biological mimic. The cross-scale physical world can be “accurately” reflected in our mind through the vision system. All information carried by light rays flows through retina via cranial nerve into brain. Visible objects are gradually abstracted at different levels with information passing into deeper neuron cells. However, the correspond-ing reflection can have great details. Recent study reveals separation of characteristics in deep neuron networks, similar to biological systems. This observation may suggest a unified data-driven multiscale methodology as schematically shown in Fig. 1b. Stiff/flexible bridging signifies another dimension of X-Mechanics. The progresses in this direction are exemplified by two cases: flexible electronics and adaptive robotics. 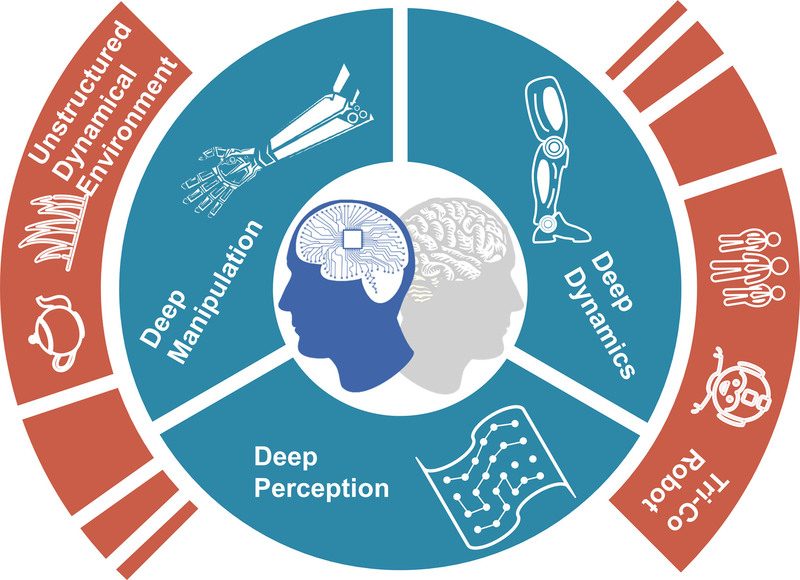 Figure 5 Key elements in developing co3-robots share the same core of deep learning. Tiny hard silicon chips may be connected by an islands/bridge layout . The combined patches are flexible due to the negligible bending resistance of wavy wires. They forms the core structure of flexible electronics . The idea is explored for flexible displays, flexible motors/pumps and flexible medical devices. For health monitoring, super-soft devices like tattoo or bio-compatible tapes with sensing and/or actuating capacities can be attached to the designated locations as tender as the baby skins or the brain/organ surfaces. A further improvement for the flexible electronics is the three dimensional neural sensing network within the brain , featured by 3-D matrix deployment nano-dots. Each dot is capable of expanding to an umbrella net. The state-of-the-art cross compliance studies can be exemplified by adaptive robotics . An adaptive robot is typically configured by a stiff frame, connected by smooth joints, and enveloped by elastic mussels and tough cords. The concept of "hard bones and flexible cords" may be re-considered for the design of adaptive robots. According to the philosophy of “Yi-Jin-Xi-Sui-Gong”, the supreme martial art classics of Shao-Lin Temple, advocated the idea of “hardening the mussel cords, and softening the bones”. That is believed to be a way of creating a “super fighter”. For adaptive robotics, one can explore new mechanics guidelines, namely reducing the bone stiffness for better adaption to the natural environment, toughening the skins, mussels and cords for better fighting power and defense armor, and assembling the robots for the broadest action envelope, the highest energy efficiency, and the supreme agility. The ideals of co3-robots can be proposed as: co-adaptive, co-sensing, and co-commanding. In this way, robots can co-exist with humankind and work for humankind in mostly unstructured and dynamical environments. To achieve this goal, dexterous manipulation, agile biped motion and machine perception are considered to be the necessary conditions and the summits of robotics as well (Fig. 3). Memory, learning and control are the essential elements for co3-robots to be distinguished from ma-chines. Thanks to the faster and cheaper computation, all these converge to a single point (Fig. 3), i.e. convolutional neuron network, in the framework of reinforcement learning. In general, a policy or a q-value function can always be approximated to any accuracy, assuming that the deep neuron network structure can evolve dynamically and match the complexity of interactions between a co3-robot and the environment. It is worth mentioning that Bellman equation (named after Richard E. Bellman), a necessary condition for optimality, lays the foundation of reinforcement learning. It was first applied in the 1950s to engineering control theory. A recent demonstration is that AlphaGo defeats Ke Jie and AlphaGo Zero vanquishes its predecessors by employing reinforcement learning (better known as self-taught) [44, 45]. Deep mimic is another example showing the capability to train multiple characters (human, Atlas robot, bipedal dinosaur, dragon) in simulation to imitate a large variety of skills, including locomotion, acrobatics, and martial arts . It is quite promising that convolutional neuron network may serve as the foundation for new generation of robots that serve the human, create hybrid intelligence, strengthen the capability of society, and submissive to the command of mankind. X-Mechanics is a new way to interpret our world by mechanics principles and methodologies. It is border-less, our view on its domain of applications cannot be restricted. It is end-less, one cannot foresee its horizon. It converges around the core of mechanics, yet diversifies to different disciplines. Four features of X-Mechanics, self-sensing, self-learning, self-powering and self-ascending, nourish it forever young. X-Mechanics, as always attempting into new lands, continuously searches the new trophies, such as mechno-chemistry, bio-mechanics and information dynamics. X-Mechanics is built upon the knowledge, skills and laws from each encounter with the other disciplines, never stops its conquest. X-Mechanics possesses a strong and vital mechanics core, never shy of its tool box and self-esteem. X-Mechanics looks at the big-picture and the critical analytics on each task on its path, always ascents to a higher level, and always directs our attention top-down. With these positive features, the rejuvenation of mechanics is expected, as the booming of basic researches in China . 1 H.-S. Hsien, Engineering and engineering sciences. J. Chinese Institution of Engineers, 6, 1-14 (1948). 2 J. R. Rice, Mechanics of Solids, Mechanics, Encyclopedia Britainnica, 15th Ed., vol. 23, 734-747 (1993). 3 A. C. Pipkin, Lecture on Viscoelasticity Theory, Applied Mathematical Sciences, Springer, 1986. 4 J. Gong, Y. Katsuyama, T. Kurokawa, Y. Osada, Dou-ble-network hydrogels with extremely high mechanical strength, Adv. Mater., 15, 1155 (2003). 5 J.-Y. Sun, X. Zhao, W. R. Illeperuma, O. Chaudhuri, K. H. Oh, D. J. Mooney, J. J. Vlassak, Z. Suo, Highly stretchable and tough hydrogels, Nature, 489, 133-136 (2012). 6 T. Sun, T. Kurokawa, S. Kuroda, A. B. Ihsan, T. Akasaki, K. Sato, Md. A. Haque, T. Nakajima, J. Gong, Physical hydrogels composed of polyampholytes demonstrate high toughness and viscoelasticity, Nat. Mater., 12, 932-937 (2013). 7 C. Keplinger, J.-Y. Sun, C.-C. Foo, P. Rothemund, G. M. Whitesides, Z. Suo, Stretchable, transparent, ionic conductors, Science, 341: 6149, 984-987 (2013). 8 C. Larson, B. Peele, S. Li, S. Robinson, M. Totaro, L. Beccai, B. Mazzolai, R. Shepherd, Highly stretchable electroluminescent skin for optical signaling and tactile sensing, Science, 351: 6277, 1071-1074 (2016). 9 T. B. H. Schroeder, A. Guha, A. Lamoureux, G. VanRenterghem, D. Sept, M. Shtein, J. Yang, M. Mayer, An electric-eel-inspired soft power source from stacked hydrogels, Nature, 552, 214-218 (2017). 10 C.-C. Kim, H. H. Lee, K. H. Oh, J.-Y. Sun, Highly stretchable, transparent ionic touch panel, Science, 353, 682-687 (2016). 11 E. Acome, S. K. Mitchell, T. G. Morrissey, M. B. Emmett, C. Benjamin, M. King, M. Radakovitz, C. Keplinger, Hydraulically amplified self-healing electrostatic actuators with muscle-like performance, Science, 359, 1-5 (2018). 12 F. Carpi, S. Bauer, D.D. Rossi, Stretching dielectric elastomer performance, Science, 330: 6012, 1759-1761 (2010). 13 T.-F. Li, C. Keplinger, R. Baumgartner, S. Bauer, W. Yang, Z. Suo, , Giant voltage-induced deformation in dielectric elastomers near the verge of snap-through instability, J. Mech. Phys. Solids, 61, 611-628 (2013). 14 X.-X. Yang, G.-R. Li, T.-Y. Cheng, Q. Zhao; C.-X. Ma, T. Xie, T.-F. Li, W. Yang, Bio-Inspired fast actuation by mechanical instability of thermo-responding hydrogel structures, J. App. Mech., Trans. ASME, 83: 7, 071005 (2016). 15 H. Yuk, T. Zhang, G. A. Parada, X. Liu, X. Zhao, Skin-inspired hydrogel–elastomer hybrids with robust interfaces and func-tional microstructures, Nat. Commun, 7: 12028 (2016). 16 Q. Liu, G. Nian, C. Yang, S. Qu, Z. Suo, Bonding dissimilar polymer networks in various manufacturing processes, Nat. Commun, 9: 846 (2018). 17 X.-X. Yang, C.-R. An, S.-T. Liu, Soft artificial bladder detrusor, Adv. Healthcare Mater., 7: 6, 1701014 (2018). 18 T.-F. Li, G.-R. Li, Y.-M. Liang, T.-Y. Cheng, J. Dai, X.-X. Yang, B.-Y. Liu, Z.-D. Zeng, Z.-L. Huang, Y.-W. Luo, T. Xie, W. Yang, Fast-moving soft electronic fish, Science Advances, 3: 4, e1602045 (2017). 19 X.-P. Chen, G.-R. Li, X.-N. Cao, Z. Zhang, Y.-M. Liang, X.-X. Yang, Y.-H. Xiao, F.-H. Zhou, Z.-L. Huang, Y.-W. Luo, T. Xie, T.-F. Li, W. Yang, Soft-rigid coexist robot adapts the extreme hydrostatic pressure, on preparation (2018). 20 K.-O. Lai, and N.-Y. Ip, Synapse formation and plasticity: roles of ephrin/Eph receptor signaling, Current Opinion in Neurobi-ology, 19, 1-9 (2009). 21 A.-M. Bao, J.-H. Luo, D. F. Swaab, Viewpoints concerning scientific humanity questions based upon progresses in brain research, Journal of Zhejiang University (humanity and social science edition), No. 7, (2012). 22 C. S. Holling, Resilience and stability of ecological systems, Annual Review of Ecology and Systematics, 4: 1, 1-23 (2003). 23 D. R. Godschalk, Urban hazard mitigation: Creating resilient cities, Natural Hazard Review, 4: 3, 136-143 (2003). 24 A. A. Griffith, The phenomena of rupture and flow in solids, Phil. Trans. Royal Society A, 221: 582–593, 163 (1921). 25 B.-X. Qiu, Complex science and revolution in city planning, City Planning, No. 4 (2009). 26 W.-C. Fan, Introduction to Public Safety Science, Science Press, 2013. 27 Y. LeCun, Y. Bengio, G. Hinton, Deep learning, Nature, 521, 436-444 (2015). 28 Z.-S. She, E. Leveque, Universal scaling laws in fully developed turbulence, Phys. Rev. Lett., 72, 363 (1994). 29 W. Yang, An outline for interfacial and nanoscale failure, Chapter 8.0, Interfacial and Nanoscale Failure, Comprehensive Structure Integrity, 8, Eds. W. W. Gerberich and W. Yang, 2003, Elsevier Science, Oxford. 30 L. B. Freund, H. T. Johnson, Influence of strain on functional characteristics of nanoelectronic devices, J. Mech. Phys. Solids, 49, 1925-1935 (2001). 31 M. I. Baskes, J. S. Nelson, A. F. Wright, Semiempirical modified embedded-atom potentials for silicon and germanium, Phys. Rev. B, 40, 6085-6100 (1989). 32 R. Phillips, Crystals, Defects and Microstructures–Modelling Across Scales, Cambridge University Press, Cambridge, 2001. 33 D. Fan, J.-W. Huang, X.-L. Zeng, Y. Li, J.-C. E, J.-Y. Huang, T. Sun, K. Fezzaa, Z. Wang, S.-N. Luo, Simultaneous, single-pulse, synchrotron x-ray imaging and diffraction under gas gun loading, Review of Scientific Instruments, 87, 053903 (2016). 34 P. Rao, T.-F. Li, Z.-L. Wu, W. Hong, X.-X. Yang, H.-H. Yu, T.-W. Wong, S.-X. Qu, W. Yang, Ductile "Ice": A frozen hydrogel with high compressive strength and ductility, submitted (2018). 35 J. Song, C. Chen, S. Zhu, M. Zhu, J. Dai, U. Ray, Y. Li, Y. Kuang, Y. Li, N. Quispe, Y. Yao, A. Gong, U. Leiste, H. Bruck, J. Zhu, A. Vellore, H. Li, M. Minus, Z. Jia, A. Martini, T. Li, L. Hu, Processing bulk natural wood into a high-performance structural material, Nature, 554, 224 (2018). 36 L. Lu, Y. Shen, X. Chen, L. Qian, K. Lu, Ultrahigh strength and high electrical conductivity in copper, Science, 304: 5669, 422-426 (2004). 37 P. Wang, S.-F. Xu, J.-B. Liu, X.-Y. Li, Y.-J. Wei, H.-T. Wang, H.-J. Gao, W. Yang, Atomistic simulation for deforming com-plex alloys with application toward TWIP steel and associated physical insights, J. Mech. Phys. Solids, 98, 290-308 (2017). 38 P. Wang, H. Wang, Meta-atom molecular dynamics for studying material property dependent deformation mechanisms of alloys, J. Appl. Mech., 84: 11, 111002-111002-8 (2017). 39 P. Wang, Y. Wu, J. Liu, H. Wang, Impacts of atomic scale lattice distortion on dislocation activity in high-entropy alloys, Extreme Mechanics Letters, 17: 38-42 (2017). 40 S. P. Lacour, W. Wagner, Z.-Y. Huang, Z. Suo, Stretchable gold conductors on elastomeric substrates, Appl. Phys. Lett., 82: 15, 2404-2406 (2003). 41 D.-Y. Khang, H. Jiang, Y. Huang, J. A. Rogers, A stretchable form of single crystal silicon for high performance electronics on rubber substrates, Science, 311, 208-212 (2006). 42 T. Zhou, G.-S. Hong, T.-M. Fu, X. Yang, T. G. Schuhmann, R. D. Viveros, C. M. Lieber, Syringe-injectable mesh electronics in-tegrate seamlessly with minimal chronic immune response in the brain, PNAS, 114: 23, 5894-5899 (2017). 43 B. Trimmer, R. H. Ewoldt, M. Kovac, H. Lipson, N. Lu, M. Shahinpoor, C. Majidi, At the crossroads: Interdisciplinary paths to soft robots, Soft Robotics, 1, 63-69 (2013). 44 D. Silver, A. Huang, C.J. Maddison, A. Guez, L. Sifre, G. van den Driessche, J. Schrittwieser, I. Antonoglou, V. Panneershelvam, M. Lanctot, S. Dieleman, D. Grewe, J. Nham, N. Kalchbrenner, I. Sutskever, T. Lillicrap, M. Leach, K. Kavukcuoglu, T. Graepel, D. Hassabis, Mastering the game of Go with deep neural net-works and tree search, Nature, 529: 484 (2016). 45 D. Silver, J. Schrittwieser, K. Simonyan, I. Antonoglou, A. Huang, A. Guez, T. Hubert, L. Baker, M. Lai, A. Bolton, Y. Chen, T. Lillicrap, F. Hui, L. Sifre, G. van den Driessche, T. Graepel, D. Hassabis, Mastering the game of Go without human knowledge, Nature, 550: 354 (2017). 46 X. Bin Peng, P. Abbeel, S. Levine, M. van de Panne, DeepMimic: Example-guided deep reinforcement learning of physics-based character skills, ACM Transactions on Graphics, 37: 4, (2018). 47 W. Yang, Mechatronic Reliability, Springer, 2003. 48 G.-Y. Huang, F. Li, X. Zhao, Y.-F. Ma, Y.-H. Li, M. Lin, G.-R. Jin, T.-J. Lu, G. Genin, F. Xu, Functional and biomimetic ma-terials for engineering of the three-dimensional cell microenvi-ronment, Chemical Reviews, DOI: 10.1021/acs.chemrev.7b00094 (2017). 49 J.-S. Rao, C. Zhao, A. Zhang, H. Duan, P. Hao, R.-H. Wei, J. Shang, W. Zhao, Z. Liu, J. Yu, K.-S. Fan, Z. Tian, Q. He, W. Song, Z. Yang, Y.-E. Sun, X. Li, NT3-chitosan enables de novo re-generation and functional recovery in monkeys after spinal cord injury, PNAS, online May 28 (2018). 50 W. Yang, Boost basic research in China, Nature, 534: 7608, 467-469 (2016). What is the information between different scales? Permalink Submitted by Xiaoyan Li on Wed, 2018-08-08 04:42. Hongtao, thank you very much for your sharing this intriguing and novel topics to mechanicians on iMechanics. I am very interested in the cross scales – mechanics for deep data analytics. Figure 1 shows a multiscale view of polycrystalline materials and the relevant information transfer between different scales. I wonder what the information is during transfer between different scales. Whether is the information the same and has the unified formatting? Thank you very much in advance. Permalink Submitted by htwang on Sat, 2018-08-11 20:02. In fields of computational mechanics, the information is well defined by the governing equations for each method. A smooth transition across domains modelled by different methods requires accurate interpretation of state variables, which is notoriously known as an artistic and demanding handcraft. For example, ab initio and molecular dynamics methods calculate atomic forces by considering the electron density and the empirical potential, respectively. The information is different at two different scales. 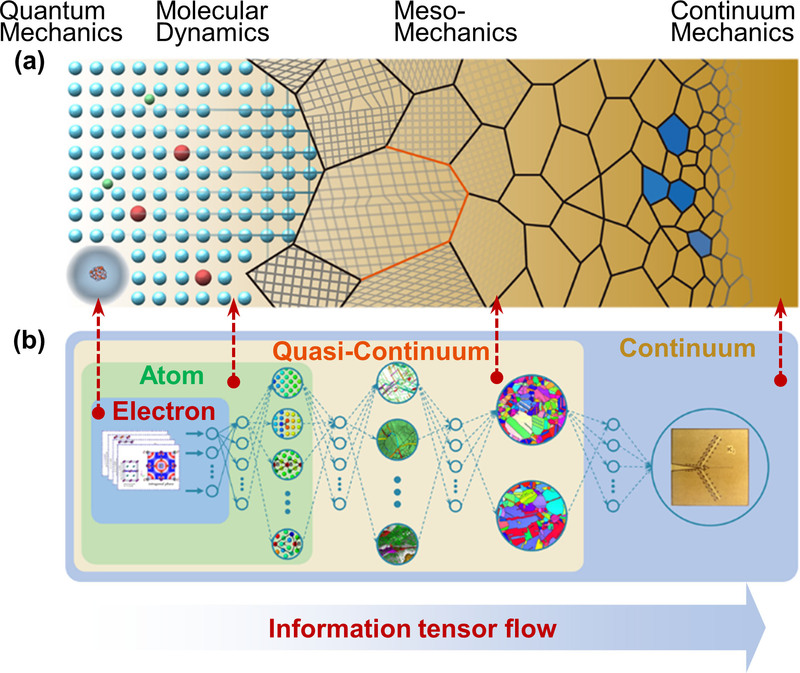 Recently, we have proposed an accurate interatomic force field for molecular dynamics (MD) simulation by hybridizing classical and machine learning potentials. A dynamic procedure has been adopted by evaluating the centro-symmetry parameter of evolving microstructures during MD simulations and accordingly modifying the highly distorted regions depicted by ML potentials. Atomic force field calculation in near-perfect or perfect lattices remain sticking to the fast EAM potential, which precisely captures the long range elastic interactions. A handshaking region is introduced in order to enforce the continuity in atomic interactions. The MD simulations using a dynamic multiscale scheme can achieve the ab-initio accuracy without raising considerable computational cost. The foundation of this approach deeply roots in the facts that the ML method has comparable accuracy to ab-initio MD simulations and possesses the same order of computation complexity to the classical MD (O(N)). The proposed multiscale method attains both high accuracy and efficiency simultaneously. In this way, the information is defined by MD method and extended to the other domain. In this example, all calculations are based on the atomic configurations, which is the only required information. To extend to macroscale, we believe that the deep data analysis on the atomic configuration may help as well. But there is no clear answer right now. What are the natures of global and local energy in solids? Permalink Submitted by miyongzhen on Wed, 2018-08-08 22:30. The authors raised an interesting question of the interactions between glocal and local energy in solids. Unlike the fluids where the heritages over which the energy can propagation are clear, say, a large-scale swirl and a small-scale vortice, in solids it seems not so. I wonder what are the natures of global and local energy in solids. Is the global energy associated with a glocal "area" of the system or with a certain level in the system's hierarchy? Thanks. Permalink Submitted by htwang on Sat, 2018-08-11 20:49. In solids, the energy has not a precise definition without given the scale. From my view, if we consider a multiscale system, the energy has a multiscale architecture as well. Permalink Submitted by Tiefeng Li on Thu, 2018-08-09 12:15. The interaction between various subjects and mechanics are truelly interesting. Take the oft robotics and mechanics as the example, the mechanical analysis of large deformation and multifield coupling can only guide the design of structure and systems， but can also propose new actuating and control mechanisms. Permalink Submitted by htwang on Sat, 2018-08-11 20:24. We are desperate for new actuating and control mechanisms in building a workable and useful robot. But we are left with desperation most of time with the “new” mechanisms. Truly interesting is the intricate relation among various subjects. It is worth mentioning that Bellman equation (named after Richard E. Bellman), a necessary condition for optimality, lays the foundation of reinforcement learning (RL). It was first applied in the 1950s to engineering control theory. A recent demonstration is that AlphaGo Zero vanquishes its predecessors by employing RL. Deep mimic is another example showing the capability to train multiple characters (human, Atlas robot, bipedal dinosaur, dragon) in simulation to imitate a large variety of skills, including locomotion, acrobatics, and martial arts. In mechanics, we call it dynamic programming, a weird name given by Bellman. I did not realize at the first time that the two fields have such a close relation. Permalink Submitted by mohamedlamine on Sun, 2018-08-12 17:01. In any system and specifically in solids the strain energy is a result of interacting internal forces generating stresses and strains and this energy is then formulated with the displacements. This form of energy has to be calssified in the scales that you have cited. It is also important to notice that if we touch a deformed solid we find it hot : is this strain energy a calorific one resulting from a transformation of energy as it is stated in the conservation theorem of the mechanical energy ? The otherforms of energy are the kinetic and interestingly the convection energy which has an origin a a transformation state. A local energy in solids can be generated from local dislocations or from unsufficiently energy in the overall domain during its development from the source.